In the world of e-commerce retargeting, performance is all that matters. When approached by a second retargeting provider, marketers are often fearful that the second retargeter will lead to worse results, cannibalization, or higher prices for each campaign. However, competition between providers has shown to have a positive impact on results. Multiple retargeting strategies can generate greater profits and drive better results through competition. From the retargeter’s point of view, adding an additional provider to auction scenarios can surely force a change in the strategy. However, from the advertiser’s perspective, the most important detail is the final outcome. This means reaching all the most valuable users—those determined to make a purchase, who visited different e-shops as well – and bringing them back to our shop. One quick advantage is ensuring quality reach. More than one e-commerce site will bid for a high-potential user at any moment. Having a second retargeter bidding on behalf of an advertiser reduces the chance of losing these users. Another advantage, in the long run, is the certainty of not overpaying. By using a payment model with effective cost targets, retargeters will adjust their functions to meet pre-agreed terms. This ensures that advertisers can receive greater opportunities to reach the majority of their most profitable users, in the most cost-effective way. Marketers can also make the mistake of assuming that every retargeting solution is equal. This leads many advertisers to not think about using a second provider because they don’t see the benefits or added value in multiple-retargeting strategies. Retargeting companies develop and train their technology completely uniquely from each other. From technologies to algorithms, to business goals, each retargeter operates in very different ways, producing widely different results. Aside from the technological differences, each retargeter prepares their own unique creatives and segments users in their own way. Thanks to modern technologies we can see the differences between providers in reaching users even at the individual level. Of course, both providers perform retargeting tasks, but the way they do it differs greatly. One retargeter can evaluate users with unique criteria. The second may use completely different deep learning algorithms that are better able to personalize creatives. Using a multiple retargeting approach enables advertisers to fill the gaps in reach of the first provider. There is almost no such thing as ad space limitations. Each retargeting tech provider is different, using different ad inventories, so the results delivered by them are not the same. For example, one provider working on Facebook inventories and the second one on another group of websites. This is a clear case with positive results, as the inventories do not overlap. But what happens when retargeters work within the same ad space? When two retargeting tools are used, the overall potential return can be presented as a solid line drawn above for both retargeters’ (as combined results). In a typical scenario, each provider will win in some cases and lose in others, but the overall return for the advertiser will be higher. Advertisers need to remember that there are more players bidding for one user. Having two, well-performing retargeters will only enable them to win more often. While the fears around multiple retargeting can happen, these are short-term obstacles that don’t take into account long-view optimization. Competition is always important—it lowers prices, offers clients a wider choice, drives better quality and drives innovations and economic development. This is also true of deploying multiple retargeters. By comparing and contrasting which retargeters perform better in different areas, many big e-commerce brands can translate the differences in results to an ultimate advantage—optimizing their campaigns and using each retargeter for specific goals. Let’s take a closer look at one of RTB House case studies – a retail brand, offering products (both offline and online) across a wide variety of categories in beauty, fitness, wellness, kitchen, home and electronics. They have stores in nearly every local shopping mall. The challenge for RTB House was to increase the volume of sales and improve ROI without negatively affecting the results of the other (first) retargeter. 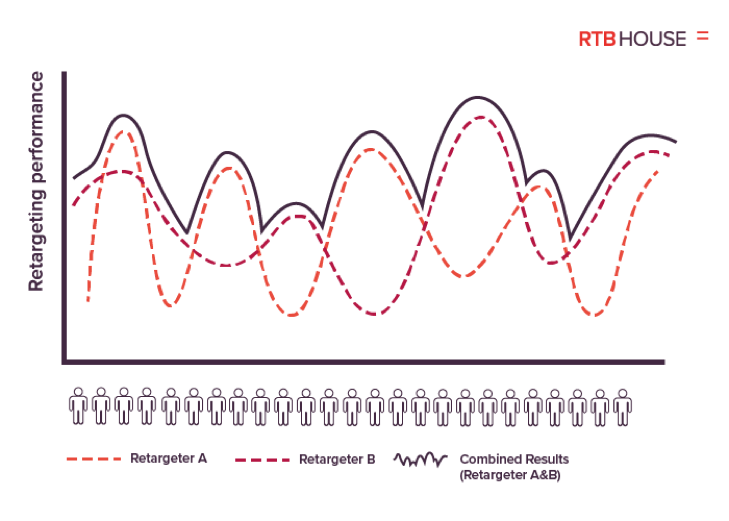 In order to achieve that, RTB House created and ran a personalized retargeting campaign, powered by Deep Learning technology as an “additional retargeter”. Goals were set in line with the Client’s business strategy and in hopes of building a long-term partnership. In just the first month of cooperation, RTB House brought in 22% additional sales to Client – all without cannibalizing their pre-existing retargeting results. After deeper analysis of the campaign’s performance, RTB House then applied specific product segmentation based on the client’s data to boost effectiveness even further. Consequently, the client received a fully customized retargeting solution, optimized specifically for their customer segments, high-potential shoppers, and many other metrics. 122% sales volume increase already in the third month of the combined retargeting campaign, compared to results delivered by a single retargeter. 9% increase in Client’s retargeting ROI. 64% (monthly avg.) total sales volume increase from retargeting.